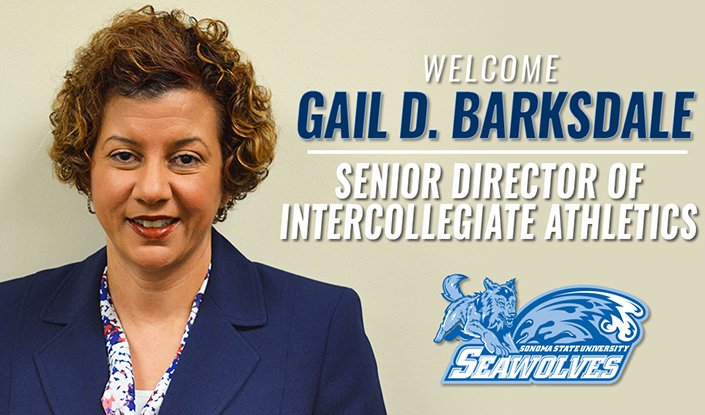 Gail D. Barksdale, a seasoned leader with national athletics and administrative experience, has been appointed Senior Director of Athletics at Sonoma State University, effective Feb. 1. Barksdale becomes the 10th athletic director in the history of Sonoma State, and follows the 20-year tenure of Bill Fusco, who retired in October. Barksdale was selected following a national search. She will be the first woman Director of Athletics since the university’s men’s and women’s operations were combined in 1981. “I am very excited and pleased that Ms. Barksdale will join us as Senior Athletics Director,” said Sonoma State University President Judy K. Sakaki. Shannon Percell, who has served as the Interim Senior Director of Athletics since Fusco’s retirement, will return to her position as Associate Athletics Director and Senior Women’s Administrator within the department. Barksdale comes to Sonoma State from Indiana University-Purdue University Indianapolis (IUPUI), a NCAA Division I institution, where she has spent the past seven years in a variety of roles, but most recently the Deputy Director of Athletics since 2014. She oversaw IUPUI’s internal operations, including several administrative units and athletic teams. In addition to serving as a member of the Department of Athletics' senior management team, she also served as the Senior Woman Administrator to the NCAA and Horizon League. Barksdale has served on several national, conference and campus committees, including the NCAA Strategic Vision & Planning Committee, NCAA Walter Byers & Jim McKay Scholarships Committee, Board of Directors of the Minority Opportunities Athletics Association (MOAA), Educational Professional & Development Committee of Women Leaders in College Sports, and on the Horizon League’s Resource Committee. Barksdale also represented the athletics department on the IUPUI Diversity Cabinet. Barksdale is a graduate of the NACDA Mentoring Institute and Women Leaders in College Sports Leadership Enhancement Institute and holds memberships in the National Association of Collegiate Directors of Athletics (NACDA), Alliance of Women Coaches, MOAA, and Women Leaders in College Sports. Prior to joining the IUPUI Athletics staff, Barksdale spent three years at Georgia State University and was responsible for overseeing the administrative and operational activities for several athletic teams. She also provided mentorship and supervision to the student-athlete development, sports medicine and strength and conditioning administrative units. Barksdale earned a Bachelor's of Business Administration degree in Marketing and Management from the University of Cincinnati and her Master's of Science degree in Sports Management and Athletic Administration from Indiana University.